Todos los platanistoideos presentan largos y finos hocicos. Su vista es muy limitada (en algunas especies, inexistentes), por lo que el sentido de la ecolocalización les resulta indispensable a la hora de alimentarse y nadar. Su aleta dorsal es poco desarrollada. Tal vez una de las características más llamativas es, al igual que en la familia Monodontidae, la capacidad de mover el cuello, a diferencia de los delfines oceánicos, que poseen las vértebras cervicales fusionadas. Los delfines de río están entre los cetáceos más amenazados, a causa de la pérdida de su hábitat, la caza por humanos y su baja población intrínseca. Los delfines de río tienen visión muy limitada, e incluso a algunas especies puede considerárselas ciegas, lo que acentúa la posibilidad de encuentros infortunados con humanos u objetos peligrosos, incluyendo redes de pesca. Algunos delfines pueden utilizar ambos hábitats; el tucuxi por ejemplo, incluido taxonómicamente en la familia Delphinidae, vive igualmente en ríos u océanos. Filogenia de cetáceos basada en secuencias de Citocromo b, mostrando la relación distante entre Platanista y otros delfines de río. La superfamilia Platanistoidea está compuesta por dos familias y cuatro géneros. ↑ The Paleobioly Database. «Platanistoidea» (en inglés). Consultado el 16 de diciembre de 2010. ↑ Dawkins, Richard (2004). The Ancestor's Tale, A Pilgrimage to the Dawn of Life. Houghton Mifflin. pp. 196-203. ISBN 978-0-618-00583-3. ↑ (9 de septiembre de 2015). "Fossil "River Dolphin" Lived Out at Sea". Geographic National Geographic. (Google Groups). URL accedida el 2 de noviembre de 2015. ↑ a b Cassens, I.; Vicario, S.; Waddell, V.G. ; Balchowsky, H.; Van Belle, D.; Ding, W.; Fan, C.; Mohan, R.S. ; Simões-Lopes, P.C. ; Bastida, R.; Meyer, A.; Stanhope, M.J.; Milinkovitch, M.C. (2000). «Independent adaptation to riverine habitats allowed survival of ancient cetacean lineages». Proceedings of the National Academy of Sciences of the United States of America 97 (21): 11343-11347. Bibcode:2000PNAS...9711343C. PMC 17202. PMID 11027333. doi:10.1073/pnas.97.21.11343. ↑ Hamilton, H.; Caballero, S.; Collins, A. G.; Brownell, R. L. (2001). «Evolution of river dolphins». Proceedings of the Royal Society B: Biological Sciences 268 (1466): 549-556. PMC 1088639. PMID 11296868. doi:10.1098/rspb.2000.1385. ↑ a b Hrbek, T.; da Silva, V.M.F. ; Dutra, N.; Gravena, W.; Martin, A.R. ; Farias, I.P. ; Turvey, S.T. (2014). «A New Species of River Dolphin from Brazil or: How Little Do We Know Our Biodiversity». PLoS ONE 9 (1): e83623. PMC 3898917. PMID 24465386. doi:10.1371/journal.pone.0083623. ↑ Gibbons, Johnny (1 de septiembre de 2015). «Fossil Specimen Reveals a New Species of Ancient River Dolphin». Smithsonian Science News. Consultado el 1 de septiembre de 2015. ↑ Pyenson, N.D.; Vélez-Juarbe, J.; Gutstein, C.S. ; Little, H.; Vigil, D.; O'Dea, A. (2015). «Isthminia panamensis, a new fossil inioid (Mammalia, Cetacea) from the Chagres Formation of Panama and the evolution of 'river dolphins' in the Americas». PeerJ 3: e1227. PMC 4562255. PMID 26355720. doi:10.7717/peerj.1227. ↑ Smith, Brian D.; Perrin, William F. (1997). «Distribution, Mortality, Diet and Conservation of Irrawaddy Dolphins (Orcaella Brevirostris) In Lao PDR». Asian Marine Biology 14: 41-48. ISBN 978-962-209-462-8. ↑ Cunha, H.A. ; da Silva, V.M.F. ; Lailson-Brito, Jr, J.; Santos, M.C.O. ; Flores, P.A.C. ; Martin, A.R. ; Azevedo, A.F. ; Fragoso, A.B.L. ; Zanelatto, R.C. ; Solé-Cava, A.M. (2005). ↑ Crespo, Enrique A.; Harris, Guillermo; González, Raúl (1998). ↑ a b c Rice, D. W. ((1 January 1998)). Marine Mammals of the World: Systematics and Distribution. Society for Marine. ISBN 978-1-891276-03-3. ↑ Turvey, S.T. ; Pitman, R.L. ; Taylor, B.L. ; Barlow, J.; Akamatsu, T.; Barrett, L.A.; Zhao, X.; Reeves, R.R. ; Stewart, B.S. ; Wang, K.; Wei, Z.; Zhang, X.; Pusser, L.T. ; Richlen, M.; Brandon, J.R.; Wang, D. «First human-caused extinction of a cetacean species?». Biology Letters: 537-540. PMC 2391192. PMID 17686754. doi:10.1098/rsbl.2007.0292. ↑ Lee, Y.; et al. First record of a platanistoid cetacean from the middle Miocene of South Korea. Journal of Vertebrate Paleontology 32 (1):. p. 231–234. doi:10.1080/02724634.2012.626005. ↑ a b Committee on Taxonomy ((2012)). List of marine mammal species and subspecies. Society for Marine Mammalogy. Archivado desde el original el 6 de enero de 2015. ↑ R.R. Reeves; T.A. Jefferson, L. Karczmarski, K. Laidre, G. O'Corry-Crowe, L. Rojas-Bracho, E.R. Secchi, E. Slooten, B.D. Smith, J.Y. Wang, & K. Zhou ((2011)). IUCN 2011. IUCN Red List of Threatened Species, Inia geoffrensis. Version 2011.2. International Union for Conservation of Nature and Natural Resources. ↑ List of Marine Mammal Species and Subspecies. Society of Mammalogy. October 2014. Retrieved September 19, 2015. Archivado desde el original el 6 de enero de 2015. ↑ Katherine Ralls; Sarah Mesnick. Sexual Dimorphism. p. pp. 1005–1011. ↑ a b c d e f g Reidenberg, Joy S. ((2007)). «"Anatomical adaptations of aquatic mammals"». The Anatomical Record 290 (6): 507–513. doi:10.1002/ar.20541. ↑ Stevens, C. Edward; Hume, Ian D. ((1995)). Cambridge University Press, ed. Comparative Physiology of the Vertebrate Digestive System. p. p. 317. ↑ Scholander, Per Fredrik ((1940)). Hvalraadets Skrifter, ed. Experimental investigations on the respiratory function in diving mammals and birds. p. 1–131. ↑ Edwards, Holly H.; Schnell, Gary D. ((2001)). Body Length, Swimming Speed, Dive Duration, and Coloration of the Dolphin Sotalia fluviatilis (Tucuxi) in Nicaragua. Caribbean Journal of Science. p. 271–298. ↑ Boto (Amazon river dolphin) Inia geoffrensis. American Cetacean Society. September 12, 2015. ↑ Tinker, Spencer. Whales of the World, ed. The Vertebrae of the Cervical Region. p. p. 37. ISBN 978-0-935848-47-2. ↑ Nummela, S.; Thewissen, J.G. ; Bajpai, S.; Hussain, T.; Kumar, K. ((2007)). «Sound transmission in archaic and modern whales: anatomical adaptations for underwater hearing». The Anatomical Record. PMID 17516434. doi:10.1002/ar.20528. ↑ Thomas, Jeanette A.; Kastelein, Ronald A. ((2002)). «Sensory Abilities of Cetaceans: Laboratory and Field Evidence». Springer Science & Business Media. ISBN 978-1-4899-0860-5. doi:10.1007/978-1-4899-0858-2. ↑ In Perrin, William R.; Wirsig, Bernd; Thewissen, J.G.M. Hearing. Encyclopedia of Marine Mammals. Academic Press. p. pp. 570–572. ISBN 978-0-12-551340-1. ↑ Ketten, Darlene R. In Webster, Douglas B.; Fay, Richard R.; Popper, Arthur N ((1992)). The Marine Mammal Ear: Specializations for Aquatic Audition and Echolocation. The Evolutionary Biology of Hearing. p. pp. 725–727. doi:10.1007/978-1-4612-2784-7_44. ↑ Herald, E.S. ; Brownell RL, J.; Frye, F.L. ; Morris, E.J. ; Evans, W.E. ; Scott, A.B. ((1969)). 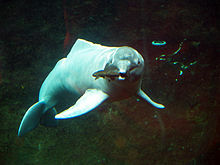 Blind river dolphin: first side-swimming cetacean. Science 166 (3911). p. 1408–1410. Bibcode:1969Sci...166.1408H. doi:10.1126/science.166.3911.1408. ↑ Stepanek, Laurie ((May 19, 1998).). Amazon River Dolphin (Inia geoffrensis). Texas Marine Mammal Stranding Network. Archived from the original on February 6, 2007. Retrieved November 20, 2013. Archivado desde el original el 6 de febrero de 2007. ↑ a b Mass, Alla M.; Supin, Alexander, Y. A. ((May 21, 2007)). «Adaptive features of aquatic mammals' eyes». Anatomical Record 290 (6): 701–715. doi:10.1002/ar.20529. ↑ a b c Thomas, Jeanette A.; Kastelein, Ronald A. ((2002).). Sensory Abilities of Cetaceans: Laboratory and Field Evidence. Springer Science & Business Media. ISBN 978-1-4899-0860-5. doi:10.1007/978-1-4899-0858-2. Wikimedia Commons alberga una categoría multimedia sobre Platanistoidea. Wikispecies tiene un artículo sobre Platanistoidea. Proyecto científico de conservación de delfines de río en Amazonia, Brasil.